For other places with similar names, see Fairfield, New Jersey. Fairfield is a township in far northwestern Essex County, New Jersey, United States. As of the 2010 United States Census, the township's population was 7,466, reflecting an increase of 403 (+5.7%) from the 7,063 counted in the 2000 Census, which had in turn declined by 552 (-7.2%) from the 7,615 counted in the 1990 Census. Fairfield is the least densely populated town in Essex County. The first Europeans to settle in the area were Dutch and the place was called Gansegat. Later it was part of Horse Neck and officially part of Newark Township. What is now Fairfield was formed on February 16, 1798, as Caldwell Township from portions of Acquackanonk Township and Newark Township. The area was named for Rev. James Caldwell. It was incorporated as one of New Jersey's initial 104 townships by an act of the New Jersey Legislature on February 21, 1798. Portions of the township were taken to create Livingston (February 8, 1813), Fairmount Township (March 11, 1862, now part of West Orange), Caldwell borough (February 10, 1892), Verona Township (February 17, 1892, now known and including what is now Cedar Grove), North Caldwell (March 31, 1898), Essex Fells (March 31, 1902) and West Caldwell (February 24, 1904). On November 6, 1963, Caldwell Township was renamed as Fairfield Township, based on the results of a referendum passed the previous day. Fairfield was reincorporated as borough on June 8, 1964. In 1978, the borough passed a referendum reincorporating itself as a township, becoming the second of more than a dozen Essex County municipalities to reclassify themselves as townships in order take advantage of federal revenue sharing policies that allocated townships a greater share of government aid to municipalities on a per capita basis. The Dutch initially settled the area near the bottomlands of the Passaic River in 1669 after purchasing it from the Native Americans naming it Gansegat which is Dutch for duck's pond. Fairfield was part of the Horseneck Tract, which was an area that consisted of what are now the municipalities of Caldwell, West Caldwell, North Caldwell, Fairfield, Verona, Cedar Grove, Essex Fells, Roseland, and portions of Livingston and West Orange. In 1702, settlers purchased the 14,000 acres (57 km2) Horseneck Tract — the reason for this name has never been determined, but historians agree that it is not because of its shape — from the Lenape Native Americans for goods equal to $325. This purchase encompassed much of western Essex County, from the First Mountain to the Passaic River. The Van Ness House, constructed in 1720, is a historic home added in 1977 to the National Register of Historic Places. The Fairfield Dutch Reformed Church dates back to 1720, and its current structure is another historic site, built in 1804. According to the United States Census Bureau, the township had a total area of 10.460 square miles (27.093 km2), including 10.296 square miles (26.667 km2) of land and 0.164 square miles (0.426 km2) of water (1.57%). Fairfield has the lowest population density of any municipality in Essex County. Fairfield Township is located in the northwest corner of Essex County. The township is bisected by Interstate 80 and Route 46. Unincorporated communities, localities and place names located partially or completely within the township include Clinton and Clinton Park. Great Piece Meadows is a swamp covering 1,170 acres (470 ha). As of the 2010 United States Census, there were 7,466 people, 2,645 households, and 2,102.775 families residing in the township. The population density was 725.1 per square mile (280.0/km2). There were 2,723 housing units at an average density of 264.5 per square mile (102.1/km2). The racial makeup of the township was 94.84% (7,081) White, 0.68% (51) Black or African American, 0.28% (21) Native American, 2.53% (189) Asian, 0.00% (0) Pacific Islander, 0.74% (55) from other races, and 0.92% (69) from two or more races. Hispanic or Latino of any race were 5.14% (384) of the population. There were 2,645 households out of which 31.6% had children under the age of 18 living with them, 67.0% were married couples living together, 8.9% had a female householder with no husband present, and 20.5% were non-families. 18.0% of all households were made up of individuals, and 11.8% had someone living alone who was 65 years of age or older. The average household size was 2.82 and the average family size was 3.22. In the township, the population was spread out with 22.6% under the age of 18, 7.0% from 18 to 24, 21.4% from 25 to 44, 28.6% from 45 to 64, and 20.5% who were 65 years of age or older. The median age was 44.5 years. For every 100 females there were 94.4 males. For every 100 females ages 18 and older there were 91.8 males. The Census Bureau's 2006-2010 American Community Survey showed that (in 2010 inflation-adjusted dollars) median household income was $97,361 (with a margin of error of +/- $11,797) and the median family income was $117,004 (+/- $7,881). Males had a median income of $69,081 (+/- $15,627) versus $51,198 (+/- $6,668) for females. The per capita income for the borough was $41,615 (+/- $5,217). About 0.5% of families and 2.8% of the population were below the poverty line, including 0.0% of those under age 18 and 6.8% of those age 65 or over. As of the 2000 United States Census there were 7,063 people, 2,296 households, and 1,981 families residing in the township. The population density was 675.8 people per square mile (261.0/km2). There were 2,326 housing units at an average density of 222.5 per square mile (85.9/km2). The racial makeup of the township was 95.63% White, 0.52% African American, 0.10% Native American, 2.82% Asian, 0.40% from other races, and 0.54% from two or more races. Hispanic or Latino of any race were 3.45% of the population. There were 2,296 households out of which 33.4% had children under the age of 18 living with them, 74.7% were married couples living together, 8.3% had a female householder with no husband present, and 13.7% were non-families. 10.9% of all households were made up of individuals and 6.0% had someone living alone who was 65 years of age or older. The average household size was 3.04 and the average family size was 3.29. In the township the population was spread out with 22.0% under the age of 18, 7.0% from 18 to 24, 27.8% from 25 to 44, 28.1% from 45 to 64, and 15.1% who were 65 years of age or older. The median age was 41 years. For every 100 females, there were 95.7 males. For every 100 females age 18 and over, there were 93.3 males. The median income for a household in the township was $83,120, and the median income for a family was $90,998. Males had a median income of $56,106 versus $39,032 for females. The per capita income for the township was $32,099. About 2.3% of families and 2.8% of the population were below the poverty line, including 4.2% of those under age 18 and 2.2% of those age 65 or over. Pharmaceutical firm Bradley Pharmaceuticals was headquartered here until the company was acquired by Nycomed in 2008. Cricket Hill, microbrewer of American Ale, Hopnotic IPA, and East Coast Lager. Telebrands, the direct marketing firm best known for its "As Seen on TV" products. 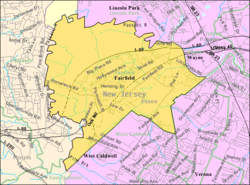 Fairfield Township operates within the Faulkner Act, formally known as the Optional Municipal Charter Law, under the Small Municipality plan C form of New Jersey government, as implemented as of January 1, 1962, based on direct petition. Members are elected at-large in partisan elections in a three-year cycle, with two council seats up for vote in the first two years of the cycle and the mayoral seat up in the third year. The Mayor exercises executive power of the municipality, appoints department heads with Council approval, prepares the annual budget and has veto over ordinances subject to override by 2/3 of all members of Council. The Council exercises legislative power of municipality and approves appointment of department heads. As of 2016[update], members of the Fairfield Township Council are Mayor James Gasparini (R, term ends December 31, 2015), Council President Thomas J. Morgan (R, 2017), Joseph Cifelli (R, 2016), John LaForgia (R, 2017) and Michael McGlynn (R, 2016). Fairfield is located in the 11th Congressional District and is part of New Jersey's 26th state legislative district. Prior to the 2011 reapportionment following the 2010 Census, Fairfield had been in the 27th state legislative district. As of March 23, 2011, there were a total of 5,378 registered voters in Fairfield, of which 1,004 (18.7%) were registered as Democrats, 2,072 (38.5%) were registered as Republicans and 2,299 (42.7%) were registered as Unaffiliated. There were 3 voters registered to other parties. In the 2016 presidential election, Republican Donald Trump received 72.5% of the vote (2,858 cast), ahead of Democrat Hillary Clinton with 25.6% (1,009 cast), and other candidates with 1.8% (70 votes), among the 4,003 ballots cast by the township's 5,798 registered voters, for a turnout of 69%. In the 2012 presidential election, Republican Mitt Romney received 69.4% of the vote (2,494 cast), ahead of Democrat Barack Obama with 29.7% (1,069 votes), and other candidates with 0.9% (32 votes), among the 3,625 ballots cast by the township's 5,459 registered voters (30 ballots were spoiled), for a turnout of 66.4%. In the 2008 presidential election, Republican John McCain received 70.1% of the vote (2,797 cast), ahead of Democrat Barack Obama with 28.5% (1,137 votes) and other candidates with 0.5% (21 votes), among the 3,991 ballots cast by the township's 5,380 registered voters, for a turnout of 74.2%. In the 2004 presidential election, Republican George W. Bush received 69.6% of the vote (2,742 ballots cast), outpolling Democrat John Kerry with 29.2% (1,151 votes) and other candidates with 0.8% (39 votes), among the 3,939 ballots cast by the township's 5,131 registered voters, for a turnout percentage of 76.8. In the 2013 gubernatorial election, Republican Chris Christie received 73.9% of the vote (1,600 cast), ahead of Democrat Barbara Buono with 25.3% (548 votes), and other candidates with 0.8% (17 votes), among the 2,193 ballots cast by the township's 5,445 registered voters (28 ballots were spoiled), for a turnout of 40.3%. In the 2009 gubernatorial election, Republican Chris Christie received 68.9% of the vote (1,819 ballots cast), ahead of Democrat Jon Corzine with 25.0% (661 votes), Independent Chris Daggett with 5.0% (133 votes) and other candidates with 0.5% (12 votes), among the 2,641 ballots cast by the township's 5,397 registered voters, yielding a 48.9% turnout. The Fairfield School District serves public school students in pre-kindergarten through sixth grade. As of the 2014-15 school year, the district's two schools had an enrollment of 1,240 students and 57.6 classroom teachers (on an FTE basis), for a student–teacher ratio of 21.5:1. Schools in the district (with 2014-15 enrollment data from the National Center for Education Statistics) are Adlai E. Stevenson Elementary School for pre-kindergarten through third grade (342 students) and Winston S. Churchill School for students in fourth through sixth grade (281 students). Students in public school for seventh through twelfth grades attend the West Essex Regional School District, a regional school district in western Essex County serving students from Essex Fells, Fairfield, North Caldwell and Roseland. Schools in the district (with 2014-15 enrollment data from the National Center for Education Statistics) are West Essex Middle School (grades 7-8; 581 students) and West Essex High School (grades 9-12; 1,070 students). StenoTech Career Institute is a technical school in Fairfield, established in 1988, that offers court reporting and medical transcription training. As of May 2010[update], the borough had a total of 62.10 miles (99.94 km) of roadways, of which 40.18 miles (64.66 km) were maintained by the municipality, 13.14 miles (21.15 km) by Essex County and 8.78 miles (14.13 km) by the New Jersey Department of Transportation. U.S. Route 46, Route 159 and Interstate 80 all pass through the Township. NJ Transit provides bus service to Newark on the 29 and 71 routes. Essex County Airport, managed by the Essex County Improvement Authority, is located in Fairfield. See also: Category:People from Fairfield Township, Essex County, New Jersey. David Greczek (born 1994), professional soccer player who plays as a goalkeeper, most recently for Swope Park Rangers in the United Soccer League. Joey La Varco (born 1995), actor. Jake Siciliano (born 1998), actor. Michelle Vizzuso (born 1977), field hockey player recognized by The Star-Ledger as the sport's top athlete of the 20th century. ^ a b c Fairfield Township Mayor and Council, Township of Fairfield. Accessed July 3, 2016. "Fairfield Township is a Mayor - Council form of government under the New Jersey Faulkner Act (Small Municipality Plan 'C')." ^ Administration, Fairfield Township. Accessed July 3, 2016. ^ Municipal Clerk / Registrar, Fairfield Township. Accessed July 3, 2016. ^ U.S. Geological Survey Geographic Names Information System: Township of Fairfield, Geographic Names Information System. Accessed March 5, 2013. ^ a b c d e f DP-1 - Profile of General Population and Housing Characteristics: 2010 for Fairfield township, Essex County, New Jersey, United States Census Bureau. Accessed November 5, 2012. ^ a b c Profile of General Demographic Characteristics: 2010 for Fairfield township, New Jersey Department of Labor and Workforce Development. Accessed November 5, 2012. ^ a b c d GCT-PH1 Population, Housing Units, Area, and Density: 2010 - State -- County Subdivision from the 2010 Census Summary File 1 for New Jersey, United States Census Bureau. Accessed November 5, 2012. ^ Look Up a ZIP Code for Fairfield, NJ, United States Postal Service. Accessed November 5, 2012. ^ Zip Codes, State of New Jersey. Accessed October 10, 2013. ^ Area Code Lookup - NPA NXX for Fairfield, NJ, Area-Codes.com. Accessed October 10, 2013. ^ a b Snyder, John P. The Story of New Jersey's Civil Boundaries: 1606-1968, Bureau of Geology and Topography; Trenton, New Jersey; 1969. p. 126. Accessed October 25, 2012. ^ Van Ness, Peter, Farmhouse, Fairfield Rd., FAIRFIELD VIC., Essex County, NJ., Library of Congress Historic American Buildings Survey. Accessed October 10, 2013. ^ A Brief History of Fairfield Reformed Church, Reformed Church of America. Accessed October 10, 2013. "At the turn of the century it was decided to erect a new church building 1/2 mile north of the old one. Made of brownstone from a Little Falls quarry, the new structure was constructed in 1804. Several decades later a tall white steeple and a balcony were added.Today the congregation continues to worship in the same historic building and the tall white steeple remains physically prominent in the community." ^ Great Piece Meadows , Wildlife Preserves. Accessed November 5, 2012. ^ Bowen, Francis. American Almanac and Repository of Useful Knowledge for the Year 1843, p. 231, David H. Williams, 1842. Accessed July 10, 2013. Population of 2,183 is listed for Caldwell Township, in conflict with 2,184 shown in table. ^ Raum, John O. The History of New Jersey: From Its Earliest Settlement to the Present Time, Volume 1, p. 241, J. E. Potter and company, 1877. Accessed July 10, 2013. "Caldwell was formed from Newark and Acquackannonck in 1798. It is about seven miles long by four wide. On its north is Little Falls and Wayne, in Passaic county, and Pequannock in Morris county, Montclair on the east, West Orange and Livingston on the south, and Hanover and Montville, Morris county, on the west. In the eastern part are the First and Second mountains, and the remainder of the township abounds in hills. The population in 1850 was 2,377; in 1860, 2,688; and in 1870, 2,727." ^ Debow, James Dunwoody Brownson. The Seventh Census of the United States: 1850, p. 138. R. Armstrong, 1853. Accessed July 10, 2013. ^ Staff. A compendium of the ninth census, 1870, p. 259. United States Census Bureau, 1872. Accessed July 10, 2013. ^ Porter, Robert Percival. Preliminary Results as Contained in the Eleventh Census Bulletins: Volume III - 51 to 75, p. 98. United States Census Bureau, 1890. Accessed July 10, 2013. ^ Thirteenth Census of the United States, 1910: Population by Counties and Minor Civil Divisions, 1910, 1900, 1890, United States Census Bureau, p. 336. Accessed November 5, 2012. Listed as Caldwell Township. ^ Fifteenth Census of the United States : 1930 - Population Volume I, United States Census Bureau, p. 716. Accessed November 5, 2012. Listed as Caldwell Township. ^ a b c d e Census 2000 Profiles of Demographic / Social / Economic / Housing Characteristics for Fairfield township, Essex County, New Jersey, United States Census Bureau. Accessed November 5, 2012. ^ a b c d e DP-1: Profile of General Demographic Characteristics: 2000 - Census 2000 Summary File 1 (SF 1) 100-Percent Data for Fairfield township, Essex County, New Jersey, United States Census Bureau. Accessed November 5, 2012. ^ DP03: Selected Economic Characteristics from the 2006-2010 American Community Survey 5-Year Estimates for Fairfield township, Essex County, New Jersey, United States Census Bureau. Accessed November 5, 2012. ^ NYCOMED US INC. ACQUIRES BRADLEY PHARMACEUTICALS, INC., Fougera, February 21, 2008. Accessed November 5, 2012. "Nycomed has announced that the PharmaDerm headquarters will be located in Florham Park, New Jersey. The Company will be transitioning key employees from Bradley's Fairfield corporate headquarters building to Florham Park over the next several months." ^ About Us, Cricket Hill. Accessed November 5, 2012. "Cricket Hill is a microbrewery located in Fairfield, NJ. In 2002, we brewed our first beers East Coast Lager and American Ale." ^ Kilgannon, Corey. "At Home of 'As Seen on TV,' a Chance for Inventors", The New York Times, December 15, 2009. Accessed November 5, 2012. "Norberto Ponce pitched his invention, the Mower Buddy, to A.J. Khubani, the founder and CEO of TeleBrands, at its headquarters in Fairfield, N.J."
^ "The Faulkner Act: New Jersey's Optional Municipal Charter Law" Archived October 12, 2013, at the Wayback Machine, New Jersey State League of Municipalities, July 2007. Accessed October 10, 2013. ^ 2016 Municipal Data Sheet, Township of Fairfield. Accessed July 3, 2016. ^ "Presidential General Election Results - November 8, 2016 - Essex County" (PDF). New Jersey Department of Elections. Retrieved December 25, 2016. ^ "Number of Registered Voters and Ballots Cast - November 8, 2016 - General Election Results - Essex County" (PDF). New Jersey Department of Elections. Retrieved December 25, 2016. ^ District information for Fairfield Public Schools, National Center for Education Statistics. Accessed December 7, 2016. ^ School Data for the Fairfield School District, National Center for Education Statistics. Accessed December 7, 2016. ^ Adlai E. Stevenson Elementary School, Fairfield School District. Accessed December 29, 2016. ^ Winston Churchill School, Fairfield School District. Accessed December 29, 2016. ^ Schools, Fairfield School District. Accessed December 29, 2016. ^ New Jersey School Directory for the Fairfield School District, New Jersey Department of Education. Accessed December 29, 2016. ^ West Essex Regional School District 2016 Report Card Narrative, New Jersey Department of Education. Accessed September 27, 2017. "The West Essex Regional School District is a comprehensive high school serving the communities of Essex Fells, Fairfield, North Caldwell, and Roseland in northern New Jersey." ^ About Us Archived 2013-11-09 at the Wayback Machine, StenoTech Career Institute. Accessed October 10, 2013. ^ Essex County Bus / Rail Connections, NJ Transit, backed up by the Internet Archive as of March 22, 2010. Accessed November 5, 2012. ^ Home page, Essex County Airport. Accessed November 5, 2012. "The Essex County Airport also known as 'Caldwell Airport' is conveniently located in Fairfield, NJ. Just Thirty Minutes from Manhattan via the Lincoln Tunnel or George Washington Bridge." ^ Pizarro, Max. "Sources: If The Race for AG was Down to Three, Grewal has the Edge to be State’s Top Cop", Insider NJ, December 11, 2017. Accessed December 20, 2017. "Having grown up in Fairfield, Grewal is a lifelong friend of Hoboken Mayor-elect Ravi Bhalla, and a graduate of West Essex High School, where U.S. Rep. Josh Gottheimer (D-5) also attended school." ^ Kaabe, Michael. "Celebrating the Stage: Theater News", Asbury Park Press, September 19, 2008. Accessed November 5, 2012. "One of the nominees this year for Outstanding Performance By An Actor is Joey La Varco, originally from Fairfield." ^ John LoCascio, Villanova Wildcats men's lacrosse. Accessed May 27, 2016. "Hometown: Fairfield, N.J.; High School: West Essex Regional.... Born November 25th, 1991 in Paterson, N.J.
^ Annan-Brady, Rita. "Actor's Life Is Goal Of Jake Siciliano, 10, Of Fairfield", The Progress News, August 14, 2009. Accessed September 7, 2015. "He may be small in stature, but 10-year old Jake Siciliano of Fairfield is getting some pretty big roles in the movies and on television." ^ Staff. "Field Hockey Assistant Coach Michelle Vizzuso Chosen As New Jersey Player Of Century", Virginia Cavaliers, October 11, 1999. Accessed November 5, 2012. "Virginia assistant field hockey coach Michelle Vizzuso (Fairfield, N.J./West Essex) was named the state's best field hockey player of the 20th century by the Newark Star-Ledger." Wikimedia Commons has media related to Fairfield Township, Essex County, New Jersey. This page was last edited on 7 February 2019, at 04:14 (UTC).